Gather up any number of #AVTweeps and ask them about how they started their career in the pro AV industry. Most answers will begin with something like this: I ended up in the industry completely by accident. 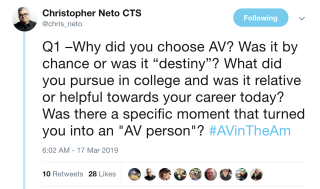 In the latest session of #AVintheAM—a popular Sunday morning Twitter chat—Chris Neto, #AVintheAM originator and social media expert, asked "Why did you choose AV? Was it by chance or was it destiny?" I was recruited into AV. I graduated from school with a degree in communications with a focus in broadcast and radio. My friend was working for a company that sold and installed VTC gear. I became a tech and was hired on the basis that I identified a BNC cable on the table. I fell into AV. First job out of college was banking, but I wanted a B2B sales job and happened upon an AV firm. I fell in love with the industry with all of its variety, new things to learn, and great people. Pre-reqs were not required for me. I ended up in the industry by chance. I spent almost 10 years selling law enforcement/military equipment to the government and then a good friend recommended I come and work with her for an AV manufacturer. Almost five years later, here I am. I would say AV chose me. I was planning to go into broadcast news. I had a cameraman in a union advise me to work at his friends' AV company until a position opened up. Twenty-six years later...I guess I am still waiting. I don't feel like I chose. I was chosen. My family was big into theater. I grew up hanging out with stage techs and tech rehearsals. Eventually, in school, I became a library tech/theater tech. I learned lighting and sound from a hands-on approach. I started at a community TV station—enjoyed it more than school. Got a little burnt out on TV and studied audio at Columbia College. Toured and did events/production before winding up in integration. Schooling helped me on the foundation and structure. My recruitment background took me into AV when I was hired to support a growing distributor. Now I'm on my own recruiting, and running's the U.K. side of Women in AV. During college, I worked as a local stagehand. Every time a “hairband” tour rolled into town, I was there turning a wrench or running a spotlight. I also worked for a rental company during the summer, loving every minute of it. It was by chance. An in-house recruiter for an integrator called, I was interested, and I took the job. I like to think AV chose me.